Preheat oven to 350 degrees. In a small mixing bowl, mix together flour, baking soda and salt. In a large mixing bowl, cream together butter, sugars, 3/4 C peanut butter, eggs and vanilla until light and fluffy. Gradually add dry ingredients, just until incorporated. Then, stir in the oats. 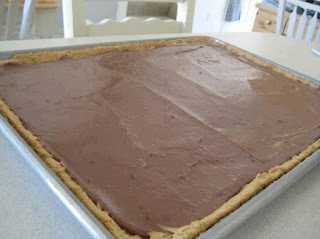 Spread onto a greased 11 x 15 Jelly Roll Pan (cookie sheet). Bake for 12-15 minutes, or until golden brown. Cool for 10 minutes. The frosting is a two step process. First, whip the remaning ¾ C Creamy Peanut Butter until it becomes lighter colored and fluffy. Carefully spread the whipped peanut butter over the pan cookie. Then, add butter to a small sauce pan and melt the butter. Add the milk and cocoa. Cook over medium heat, stirring constantly. Heat just until boiling. Remove from heat and add vanilla. Then, gradually add the powdered sugar. Stir until thickened. Pour over the peanut butter and gently spread over the cookie. Cool completely, and slice into bar cookies.